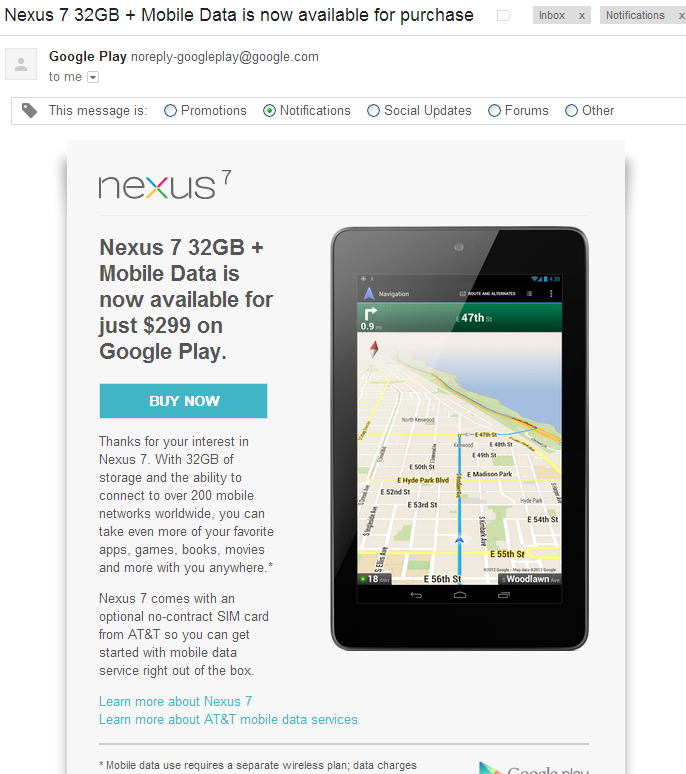 I always get informative mails first hand regarding new apps, features, devices etc, thanks Google for considering . 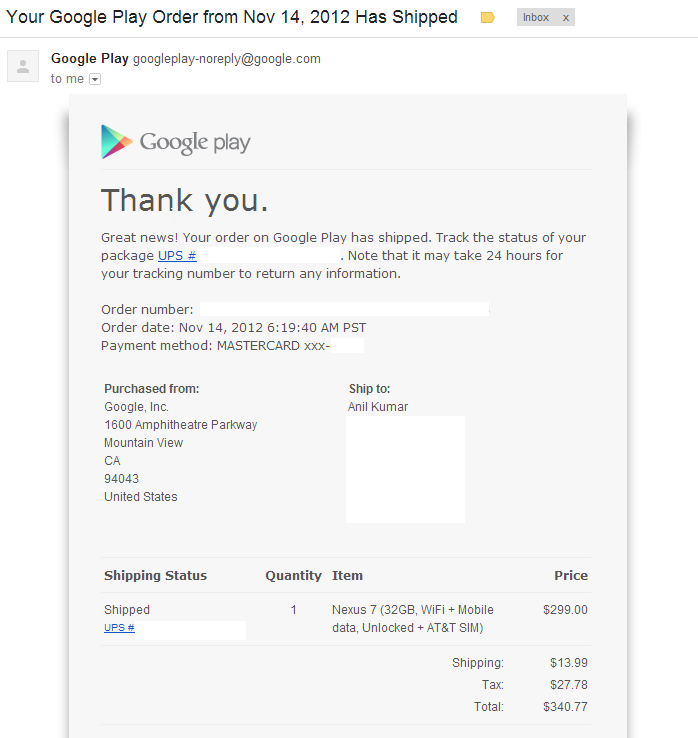 I recently went to Google Play and registered for the availability of the Nexus 7 tablet. I got the mail as below. I have tried several times to purchase the earlier Nexus 7 tablet from their site and they have declined purchase. 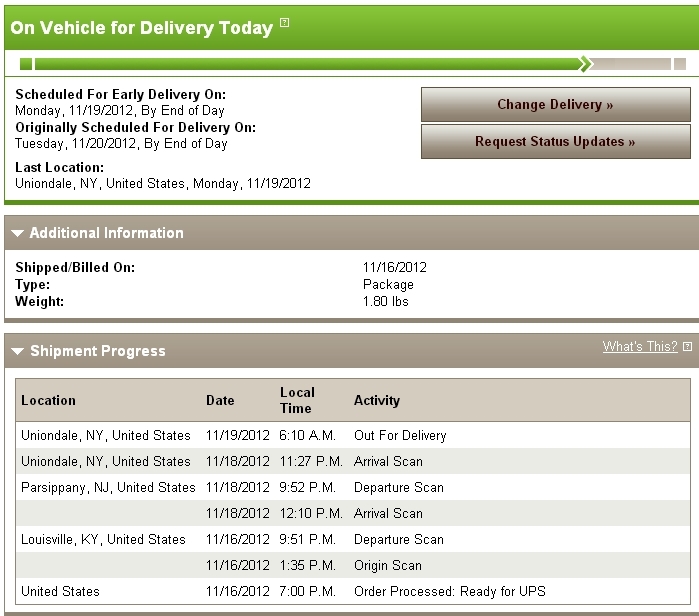 But on 14th November I got through and ordered the Nexus 7 32GB, WiFi + Mobile data + Unlocked + AT&T SIM. 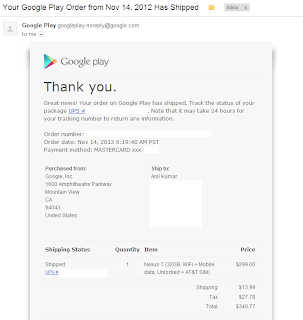 I had my fingers crossed till a few minutes back where I got the below mail from Google Play that the device is shipped. So I am getting an Android device which is only less than a week old which has got a lot of rave reviews from across the globe. I hope to get it to my hands the coming week. 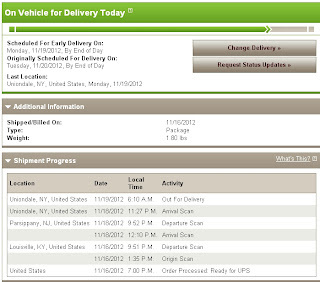 Today's (19th November 2012) update, item on road to delivery to my US address. At last I got it on the 8th day, the new Google Nexus 7 32GB, WiFi + Mobile data + Unlocked + AT&T SIM. I will make an un-boxing which will be my first. Nexus 7 32Gb +Mobile data unlocked +att sim. Can it be used with any SIM in India if bring that device to India? I wanted to buy one, but not sure if the device is supporting cellular networks of India or not. You can use the SIM provided you activate it with a roaming option which is very costly as per Indian standards. I don't want to use the device with at&t Mobile data India anyway. I wanted to knw, if it works with Indian cellular service providers like airtel, Vodafone or something. You can use any SIM card from anywhere in the world, means it is SIM unlocked. I just wanted to confirm that. Dear Dhananjay..you can go for slimportconnect.com, their devices can give micro usb to hdmi conversion. They cost is around 70USD. I have not tried this and cannot guarantee that it will wor. Please Google for any more help for "micro usb to hdmi". Dear Dhananjay..Both GTab2 and Nexus are different. 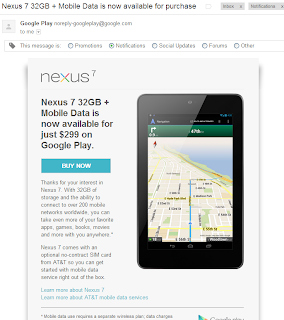 Those of who like me who wants the pure Android experience can go for Nexus devices. You may get some advantages on GTabs2 for which it is better do Googling as I have not used it.